Tagged under Takeshi Konomi, J.C. Staff, Production I.G, Series. Prince of Tennis takes place in modern Tokyo, following the journey of tennis prodigy Ryoma Echizen. Ryoma enrolls in Seishun Gakuen (Seishun Academy), Seigaku for short, a school famous for its strong tennis club and talented players. Because of his cool and apathetic attitude, upperclassmen challenge him to matches. However, Ryoma had won the American junior tennis championship four times in a row, and easily defeated the upperclassmen. Making new friends and learning new tennis tactics, Ryoma and the Seigaku tennis club strive to win the All-Japan Junior High Tennis Team Championship! Based on the synopsis by niomea. A nice positive thing about this story is how the characters are diverse (which, again, is a nice touch to reality). From Echizen to Momoshiro to Kaidoh, just by these three alone, you can see that the character's personalities are VERY unique (again, reality). Another positive part about this is how they can get each respective personality to complement each other well when together. Another nice one is just how diverse the characters react when they score a point when they play other teams. The slapstick humor was also a nice touch. - Each individual, as mentioned earlier, is unique with their very own personalities, and by their first tourney, you'll begin to remember their shots and their specialties, as well as their normal personalities. But I really prefer the New Prince of Tennis as well as New Prince of Tennis vs Genius 10! Very cool shots and the high schoolers -> OMG Hot! The only thing that is nerving is, that the guys aren't looking like middle shoolers! I don't reccoment this title for someone who is a sport player(different from sport maniac...) because they will find the story are impossible and fiction! 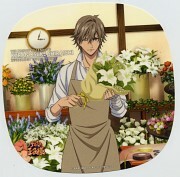 I really like Fuji and Tezuka they are both awesome. When I'm tired and stressed, I just think of Prince of Tennis and I'll then regain some strength afterwards (haha). Maybe it's because the characters are really fun to watch (and read), and this is one of the long shounen series that I want to experience all over and over again. It's the usual sports anime, and the techniques are way too awesome, but they keep me entertained. I love this series. I think making an anime out of tennis was a great idea. It has motivated me to play tennis so much. Before I watched it, I thought tennis was just another boring sport but Prince of Tennis changed that. The art is excellent. The characters look Japanese and each player is easily distinguishable. Their skills in tennis are also incredible and unbelievable shot (though sometimes unrealistic). Well, the main character may be a bit arrogant but he gets along well with his teammates. This story is wonderfull and awesome. I loved the 178 chapters including additional chapters. I've seen the Zenkoku TaiKai-Hen and Another Story OVA's. It cost me find them, but in the end it was worth the effort. and lots of hyper-weird techniques. matches. However, it is hard to believe that high school students are able to play the way they do... or look the way they are. I mean, some of them seem older than me!! a big lie!! Well, most of the anime is but... well, you know what i mean. Nevertheless, Prince is really good and joyable. Maybe matches are too long but is worthy the time spent because of the impossible techniques shown. And there is a lot of extra material, i mean, stuff to be bought, a lot of merchandising. The Prince movie is just a big paranoia, a veeeeeeeery big one. Unreal to utmost limits. All in all, it is good. I really like this series because of the characters and the supernatural techniques that they used in playing tennis. All of the characters are unique and I really adore all of them. This is one of the long running titles that I have finished and intend to read again. I'm currently reading the sequel: New Prince of Tennis. To sum it all... IT WAS LONG BUT WORTH IT. I've gotta say its addicting (as long as you don't get stopped in the middle). The anime also gives action to a series that normally might be considered boring. But it isn't and instead is very exciting in a way that is like any other anime, anticipation, but has that spots feel as well: who will win? How? Go Go! Fight Fight! There is little drama in the way of friendships/romances. All the drama takes place on the tennis court usually and is of the competitive type between people playing in singles and that of the doubles. The only people-drama would be of Kaido and Momo which is kind of like the comic relief (along with the two-year-playing-tennis-know-it-all-first-year). 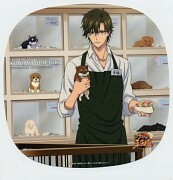 Tenipuri is probably one of the few series that most of the male characters, if not all, are considered bishounen. 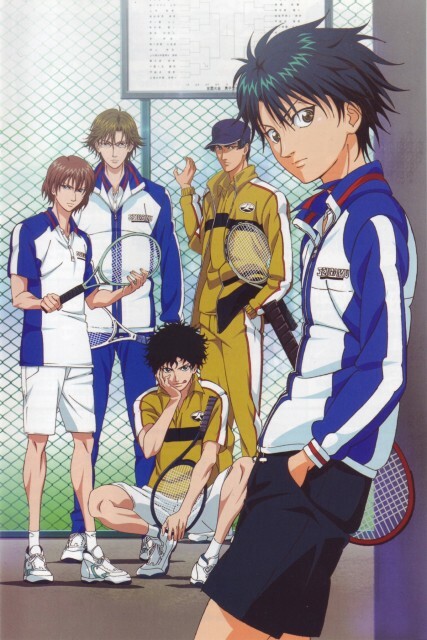 But I love Tenipuri not only because of its cool and handsome characters, but also because of the music and the values learned especially in relation to sports and sportsmanship, friendship, and even responsibility. For me, I learned a lot after watching this anime series. I do believe it highly influenced the good in me today, and always will. But a lot of things that unreal for a drama, for example, "muga no kyouchi", Ryoma manage to win the final match just by achieving "muga no kyouchi"?????????????????????????????????????????????????????????????????????????????????????????????????????????????? How was that possible when his opponent is Japanese best teenage player????????????????? The first series was really nice! I loved every bit of the series. Near the end, was really heart rending! I loved how Ryoma Echizen respects Tezuka and all his upper class men. It's a good series to watch, but quite long and has a couple of OVA's that aren't even finished yet. I think the movie was over the top though the live drama was also good! Every one of the series was amazing!